Nazem Kadri: Hard Worker or Reckless Player? There’s no arguing that the 2014-15 season has been a dismal one for the Toronto Maple Leafs. On Wednesday, it became apparent that the team would be hit with yet another blow as second-line centre Nazem Kadri was handed a four-game suspension for his illegal check to the head of Oilers’ Matt Fraser. While the team has had a rough go since the new year, Kadri has been arguably one of the more consistent players on the ice for the Leafs. Sure, his offensive production is down and won’t reach his career high (50 points in 2013-14), but he’s found a way to stay out of the box while stepping up his defensive zone play. Now there have been some questions surrounding the former London Knight during his NHL tenure. Can he develop into an all-around player? Can he improve his line mates’ game? How will that exuberant confidence come into play? But with his recent suspension by the team and this subsequent punishment from the league, is Kadri taking more steps backwards than forwards in his development as an NHL player? The easy answer is to call Kadri a dirty player – to refer to past incidents and listen to every Ron Wilson interview since he was let go by the franchise. Unfortunately, it isn’t that simple. Kadri’s easily been the most consistent top-six forward the Leafs have iced this season. While the club recently forced him to sit out a few games for disciplinary issues, club president Brendan Shanahan acknowledged that it was simply a teaching moment for a young player and reiterated the fact that Kadri is in the team’s plans for the future. Yet, the 24-year-old finds himself looking on again as his teammates take to the ice. At least that’s the case for the next four games. But is it a case of playing reckless hockey or has Kadri’s hard work simply put him in some difficult situations? In 243 career regular season games in the NHL, Kadri’s been suspended by the league twice. Add that to his 130 penalty minutes and he doesn’t seem like the greatest candidate for being a dirty player. In fact, often referred to as a ‘pencil’ by his online haters, Kadri’s known for his innate ability to draw penalties on a regular basis. Now, consider this. In 2013, Kadri was suspended three games for running over Minnesota Wild goalie, Niklas Backstrom. That suspension was nearly 17 months ago. While a player’s history of suspension never vanishes, his designation as a repeat offender (for salary lost) changes after an 18-month period – a period he was one month shy of reaching. Kadri on being repeat offender: "The probation time is like 18 months or something like that & I’m at 17 so another tough break." So let’s clear that up. The league still takes into consideration his history (the Backstrom hit) when deciding his fate in this new incident. However, his ability to stay out of trouble during that time can also play into his suspension. Unfortunately, 17 months isn’t long enough. And while it might not be exact, the way the Kadri suspension can be interpreted from the video posted by the NHL’s Department of Player Safety is as follows: two games for the incident, one game for the injury suffered by Fraser and one game for Kadri being a repeat offender. So what happens now for Kadri? Is it time for him to change his game? As TSN’s Mark Masters reports, that’s the exact opposite of what Kadri thinks. Kadri: "No matter if I’m on the sidelines or on the ice, I’m still going to bring that positive mentality & positive attitude to the room." 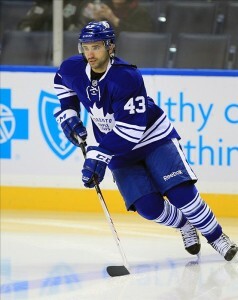 Kadri going to change the way he plays? "No, not at all. I'm still going to play hard every single night." Kadri: "I’ve had a bunch of hits that have been totally fine, totally clean so I like my percentages when I’m trying to hit somebody." While this may be just another lesson in the growth of Nazem Kadri as an NHL player, he does realize that his hard work and hard-nosed play won’t always land him on the doorsteps of punishment. He will forfeit almost $142,000 for this particular offence – which will be handed over to the Players’ Emergency Assistance Fund – but, Kadri expects to get past this latest hurdle and come back just as strong and just as hungry. Like the organization, fans hope that this will just be another stepping stone in his growth as a player rather than a step in the wrong direction.